When writing your middle school social studies teacher resume it’s important to make sure your resume is effectively targeted toward your specific teaching area. Most teachers think that if their resume is focused on teaching, that that is good enough. However, as you know, there are a lot of different teaching areas that have very different content and strategies. For instance, a core elementary teacher has very different content demands than a high school math teacher, who has very different duties than a special education teacher, etc. So, when you create your middle school social studies teacher resume, you need to make sure you include all items that are important to your specific teaching area. 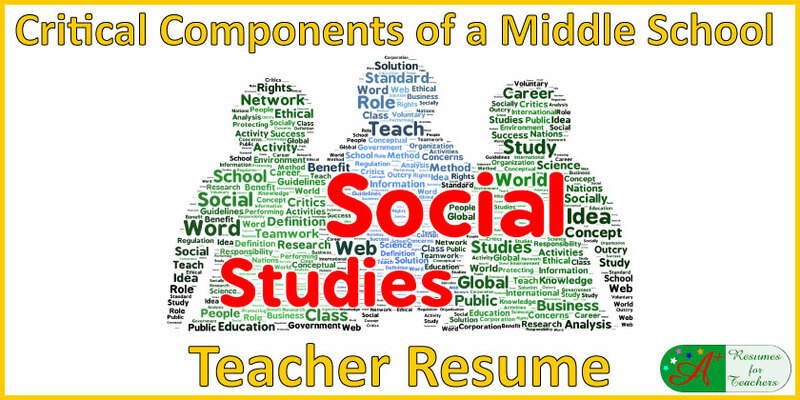 When writing a middle school social studies teacher resume, you must identify the keywords or buzzwords typically used by school districts looking for teaching candidates. One of the best ways to find buzzwords is by scanning school district websites and looking for middle school social studies pages. Often job descriptions and social studies related web pages will include what a school district is most concerned with, and this will include teaching methods, content familiarization, and other teaching-related traits and duties. These are the items you will want to include on your resume. Additionally, to find the right keywords to use in your education resume, it is important to observe employment ads and evaluate the words commonly used by employers and job seekers. You can search for employment ads online. Make sure that you are examining job ads thoroughly so you will not miss out on any important buzzwords that can help you optimize your resume and cover letter. Of course, you should only include keywords and items that you are familiar with and that you use while teaching. Don’t put keywords on your resume just because you know a school district wants to see them. You still need to ensure that your resume accurately reflects your skills and experience. For your resume to become searchable, you have to front-load your middle school social studies teacher resume and cover letter with a list or a summary of highly optimized keywords. Usually, only the first 100 words or so of your uploaded documents are searched by the applicant tracking systems. However, even though there should be an emphasis of keywords at the beginning of your documents, there is no reason why you can’t use keywords throughout your resume and cover letter to further optimize and ensure a highly searchable document. These are just some of the potential keywords you can incorporate into your middle school social studies teacher resume and cover letter. You can further expand on these keywords by looking for buzzwords that appear in teacher job descriptions and employment ads. The first keywords mentioned above are most likely relevant to all teaching positions. In addition to including keywords in the introduction of your resume, you should also use some throughout the rest of your resume, especially in your professional experience section. Your resume should showcase your skills and talents in helping students to learn and retain social studies subject matter. Your resume should demonstrate how you use teaching methods such as cooperative learning, technology, debates, and group projects. Or possibly using the Socratic method in your social studies lessons to help students engage in learning, actively participate in historical, economic, and geography activities, and retain relevant information as shown by performance on state exams, class projects, and end of unit tests. Communicating this type of information will help show the prospective school that you not only know about these important concepts and keywords but that you’ve also used them in your teaching to make a difference in your students’ academic success. The need to use keywords for an optimized and targeted resume or cover letter is crucial because it can dictate your online presence and your capacity to be easily found by potential employers. Teaching is a very competitive industry, and there are hundreds and thousands of applicants in the same field who may be competing against you for the same middle school social studies teaching position. The use of subject related keywords in your resume will give you the edge you need to become more noticeable to employers. If you’d like to see some examples of utilizing keywords in education resumes, have a look at our education resume examples. Next post: When Writing a Cover Letter for a Teaching Job Are You Guilty of Doing This?